This is by no means a complete list of local hotel accommodations. Here you'll find some simple reviews of many bed and breakfast lodgings in our resort area. For a complete listing of local hotels and other lodgings' websites on the Internet please click on the link for the appropriate Directory for either Zihuatanejo, Ixtapa or Troncones listed on the homepage. Casa Arcoiris - An ecologically conscious "Bed & Breakfast" inn with two comfortable suites featuring air conditioning, TV, and wi-fi access. Located on a small hill overlooking the coconut grove at La Ropa Beach, it has a pool and offers a panoramic view of Zihuatanejo Bay. LGBTQ friendly and respectful of everyone. There is a common kitchen and 24-hour security. Casa del Encanto - Doña Laura offers a very special place for you at La Barra de Potosí. Enjoy the most relaxing atmosphere possible in this tiny fishing village only 30 minutes by car from Zihuatanejo on an endless beach. Casa Delfin Sonriente - Spacious and verdant, this 6-bedroom beachfront Bed and Breakfast inn with a pool on Playa Troncones can be rented in its entirety or as individual suites and bungalows by the day or by the week. There is an outdoor BBQ area and areas for various outdoor activities. Any closer to paradise would be hard to get. Casa Ki - About as much relaxation as a person can handle! 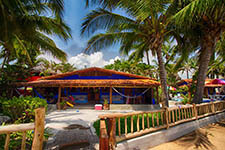 This B&B has Mexican-style bungalows on the beach at Troncones in a natural setting with a beautiful "meditation palapa". Get the kinks out here! Casa Las Piedras - Enjoy a peaceful oceanfront vacation at this luxurious four-bedroom bed & breakfast home with a pool on the beach at Playa Troncones. Surfing instruction and board rentals can be arranged, and spa services including therapeutic massage are available on premises. Hacienda La Rusa - Fabulous affordable lodging in a Mexican colonial-style bed & breakfast inn with 2 swimming pools in the enchanting fishing village of Barra de Potosí. Located just a few steps from the beach and over a dozen excellent fresh seafood restaurants. 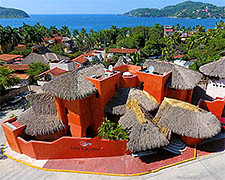 Rent individual suites or rent the entire hacienda. Amenities include wi-fi and satellite TV. Inn at Manzanillo Bay - Fine cuisine and peaceful relaxation combine with excellent service at this eco-lodging on the beach at Playa Manzanillo near Troncones. Your host and chef Mike Bensal will assure that your vacation in paradise is a most pleasant and memorable experience. Tres Mujeres Hotel & Yoga Retreat - This enchanting B&B lodging is located right on the beach at Playa Troncones and offers individual one-bedroom suites featuring air-conditioning, ceiling fans and private terraces, all with panoramic views, built around a central pool and garden area. Located within easy walking distance of the village, numerous restaurants and several small stores. Villa Don Manuel - Bed and breakfast inn offering six comfortable one-bedroom bungalows, located in a coconut grove across the road from the beach of Playa Blanca in Barra de Potosí just south of Zihuatanejo. Amenities include mini-fridge and pool. Villa Carolina - A small elegant contemporary B&B Mexican style villa hotel ideally situated less than 100 meters from lovely Playa La Ropa in Zihuatanejo. It features a private pool and luxurious suites with kitchenettes, A/C and internet.